Get on the mailing list to get updates on what's new at the festival, by e-mail. Roger and Yannick were recorded playing for a fest-noz on the 11th of November, 2000, in Plestin-les-Grèves. 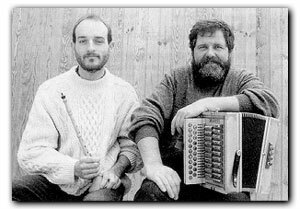 Roger has been playing a two row diatonic accordion since 1975, and Yannick began to play the bombarde when he was just 10 years old. Yannick played professionally for a year when he was in the French Navy pipe band "Bagad de Lann-Bihoue", but Roger has never played professionally. Yannick was born in Lannion, into a family immersed in Breton culture. His sister is a very good accordionist, and his brother is a fine pipe player (playing with Gilles Lehart). Yannick works and lives in Guingamp (15 miles from Lannion) at a farming co-op as an agriculture technician. Roger is also Breton, and he is in the French Air Force, presently stationed in Lannion, but soon to be stationed in Paris, and he will commute every weekend, so that he can continue to play at fest nozs and spend time with his family. "My track to trad music is quite complicated... Started with folksingers in the early 70's (Seeger, Dylan, Baez, Waring, Mason...), and then I got interested in 30's and 40's protest songs, (Guthrie, Leadbelly...). Following that, I then started to look for "MY" roots, and found Stivell, Tri Yann, Servat... In these time I was playing guitar and Appalachian dulcimer (Jean Ritchie...) and listening to French diatonic accordionists (Pérone, Blanchard, Oller...). I decided this instrument was interesting to learn and at around the same time I met an old accordionist in my birthplace (Charles Le Guen, perfectly unknown to the world...). He had a terrific repertoire and he was playing for weddings during the 20's and 30's. When I stopped roaming around the world in 1985, I learned of Yann Dour and his books, met Alain Pennec and played for a few years with Pierre Boyer in Lannion. At this time, I took the time to read about and listen to more and more Breton music, met some great pipers, bombarde and flute players, (Veillon, Moal, Chaplain, Larivain, Le Féon, Lehart...) singers (brothers Morvan, Marcel Guillou, Louis Roparz, Jean-Yves Leroux, Iffig Troadec...) even accordionnists !! (B. Lasbleiz, P.Lefèvre, Yann-Fañch Perroches...) I'm more interested in traditional dance music, either from the Breton speaking area or from the Gallo speaking area of Brittany, I seldom play waltzes, don't like 3/4 beat too much (don't play mazurkas either..). There are so many traditional tunes to play, that should keep at least one or two lives busy!!! "What do I like the most? Plin of course as there are a lot of good specialists in Lannion area, Gavotte because it has a lot of freedom for interpretation, dances from Vannes area (an dro, hanter-dro laridés). The repertoire is huge, and from eastern Brittany: Ridées (same as the gavotte, lot of freedom...) and avant-deux: huge repertoire!!! Dances from Loudéac area are so interesting too... Of course the old dances from Tregor are interesting too, and I worked a lot on the subject with B. Lasbleiz and Dastum Bro Dreger. This dance disappeared between the two world wars and we had to search for tunes and even for dance steps. Special thanks to Kay Hickman for the recordings and the notes on the music.